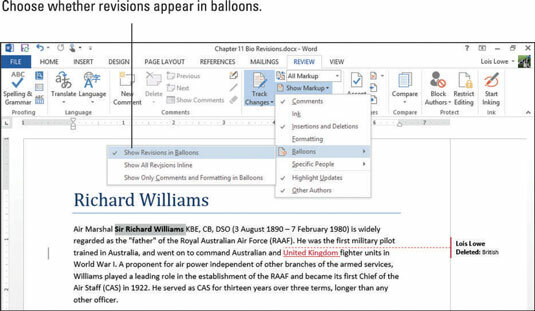 You can control how much of your Word 2013 document’s markup you see onscreen. Sometimes it may be appropriate to see every little change, down to the last comma, whereas other times a big-picture approach is better. Choose Review→Display for Review and select Simple Markup. Note that the markings from the previous exercise are no longer shown. Along the left side of the paragraph are two short red lines indicating which lines of the paragraph contain changes. Choose Review→Display for Review and select All Markup. Choose Review→Show Markup, and on the menu that appears, note the types of markup that you can display or hide. For example, you can choose to include or exclude Comments, Ink, Insertions and Deletions, and Formatting. You can also choose to see comments from only specific people. 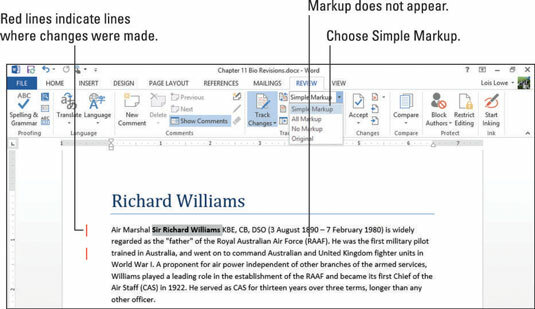 Click Formatting to deselect formatting from the list of markup types shown. The balloon showing the bold formatting change disappears. Click the dialog box launcher in the Tracking group. The Track Changes Options dialog box opens. This dialog box contains many of the same options that you find on the Show Markup menu (which you open in Step 2). The dialog box holds a few additional items, too. Click the Advanced Options button. The Advanced Track Changes Options dialog box opens. Take note of the various colors and symbols that are set to mark the different types of changes. 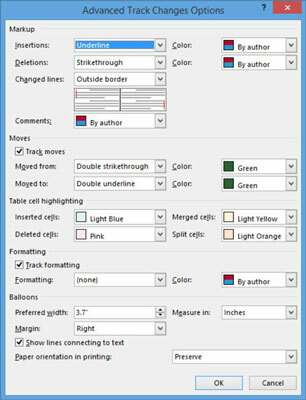 For example, note that the color of insertions and deletions depends on the author (with a different color assigned to each author). Click the Cancel button to close the Advanced Track Changes Options dialog box without making any changes. 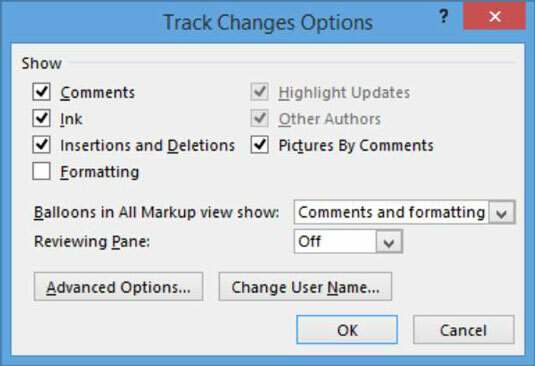 Then click Cancel (or Close) to close the Track Changes Options dialog box without making any changes. Choose Review→Show Markup→Ink to deselect the Ink option. 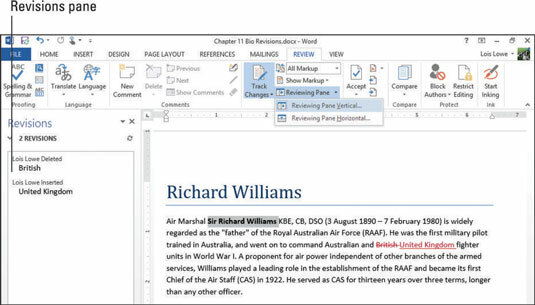 The Ink feature, available in most Office applications, enables users to annotate a document by drawing on it using a finger or stylus (on a touchscreen) or by dragging with the mouse. Most people don’t use it, so it’s a good type of change-tracking to turn off as practice for customizing your change-tracking settings. Choose Review→Show Markup→Balloons→Show Revisions in Balloons. The deletion of British now appears in a balloon. The addition of United Kingdom doesn’t appear in a balloon because it’s an insertion. Choose Review→Show Markup→Balloons→Show All Revisions Inline. 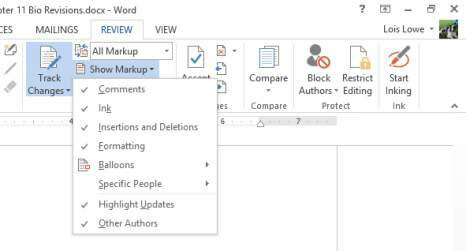 The markup area disappears from the right side of the document and all balloons disappear. From the Display for Review drop-down list, choose No Markup. All revisions are shown, but all revision marks are hidden. From the Display for Review drop-down list, choose Original. All revisions are hidden, and all review marks are also hidden. From the Display for Review drop-down list, choose All Markup. All revisions are displayed, and all review marks are also displayed. Choose Review→Reviewing Pane (click the arrow, not the button face)→Reviewing Pane Vertical. A Revisions pane appears to the left of the document, showing each revision. Choose Review→Reviewing Pane→Reviewing Pane Horizontal. The task pane moves to the bottom of the document. Choose Review→Reviewing Pane (click the button face, not the arrow).